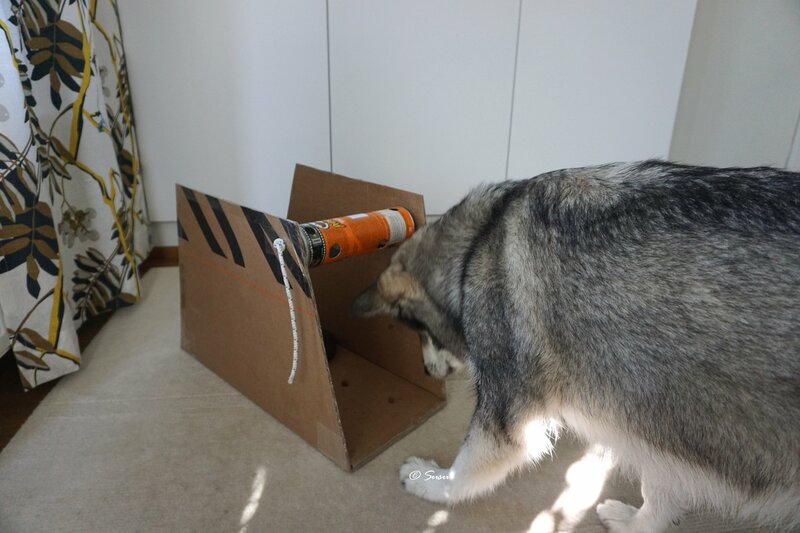 In this game a dog needs to roll the tube so the treats fall out from the holes. You can make the holder from cardboard like I did or you can just tie the game for example in between two chairs. Which ever way you choose you need to consider the height, so that it won’t be too high for your dog. 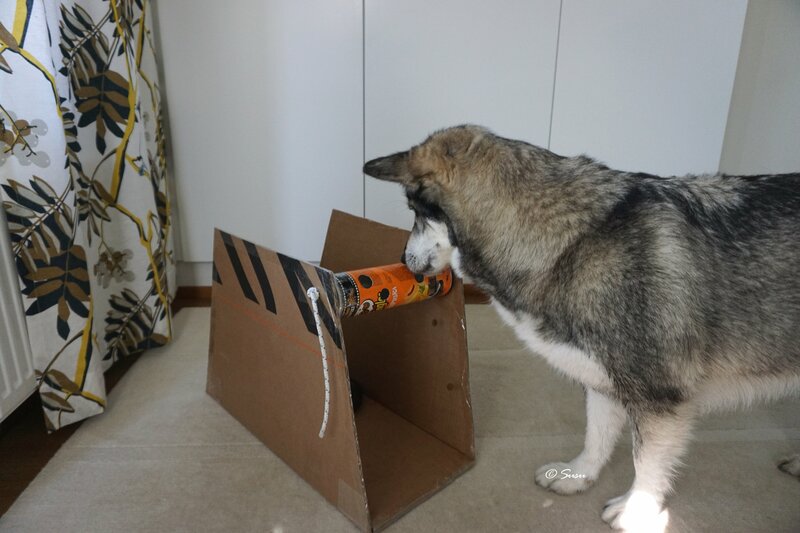 I recon that the hight can be up to the same as your dog’s height. 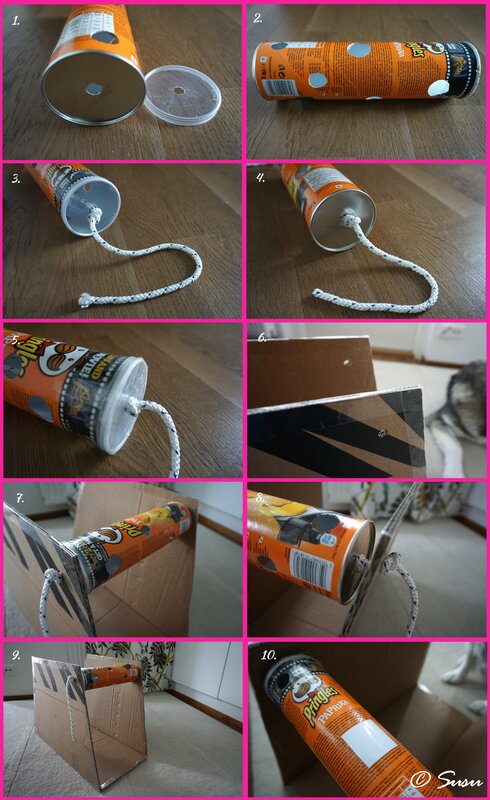 I took a Pringles tube and I punched holes on the bottom of the tube and on the lid as well for the rope. 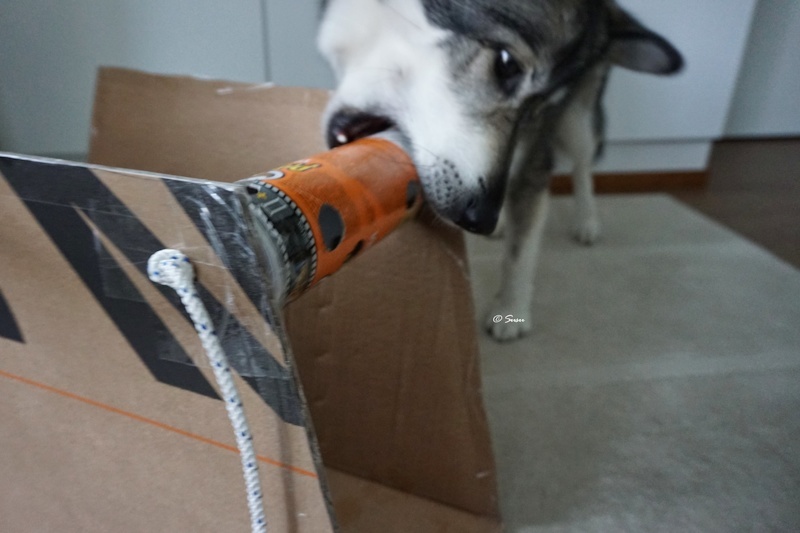 Then I cut 10 holes on the tube for the kibble to fall out. Look at the picture mosaic, pictures 1 and 2. I cut too many holes on purpose so that the game would be easy on the first try. I wanted the game to be too easy so that Miki wouldn’t be attempted to shake the holder. I pulled a 6 mm rope through the tube. 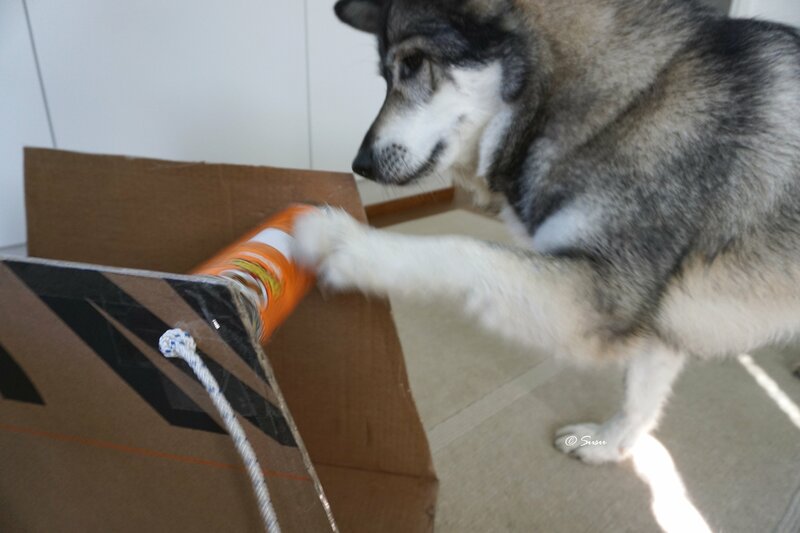 Then I tied knots on the top of the lid and on the bottom of the tube. 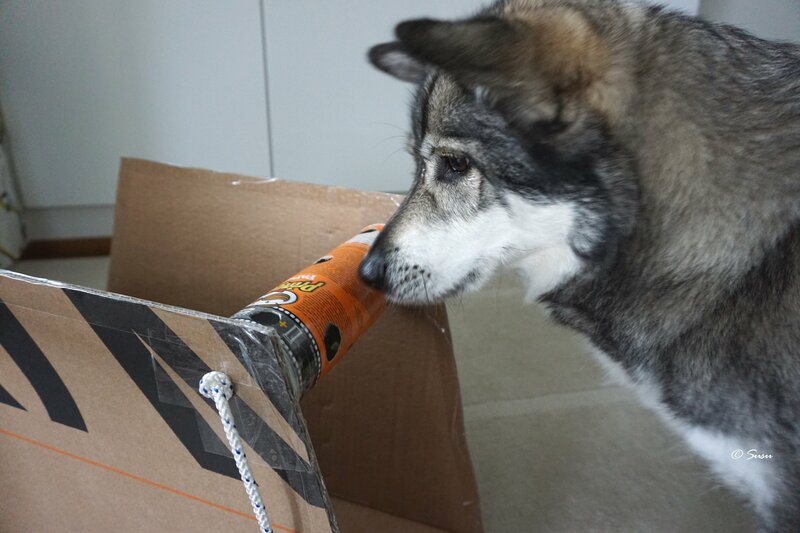 Then I secured the lid to the tube with some clear tape (mosaic, pictures 3-5). I punctured holes to the cardboard holder (mosaic, picture 6). I pulled the rope through the holes and tied it with knots from outside (mosaic, pictures 7-9). When the game was set up I placed two flat weights on the bottom to keep it in place. 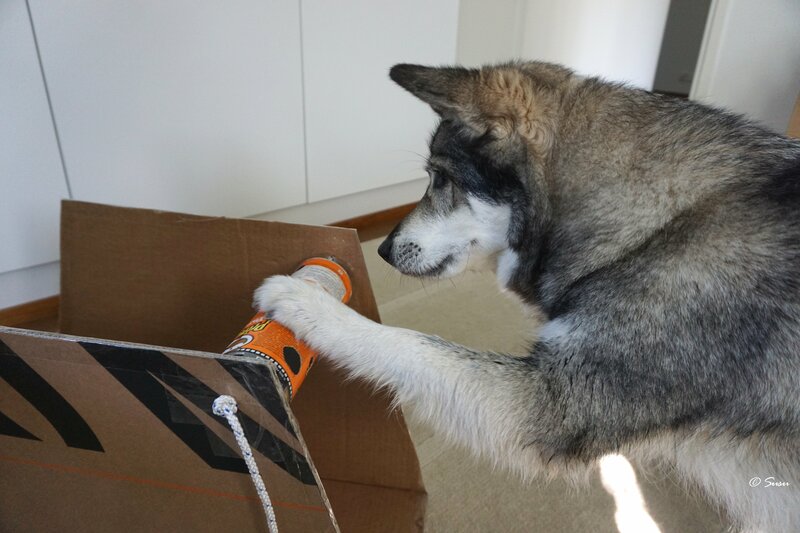 Use only flat weights so that the weights cannot roll or fall on your dog’s paws. I used kibble and some small treats with this game. 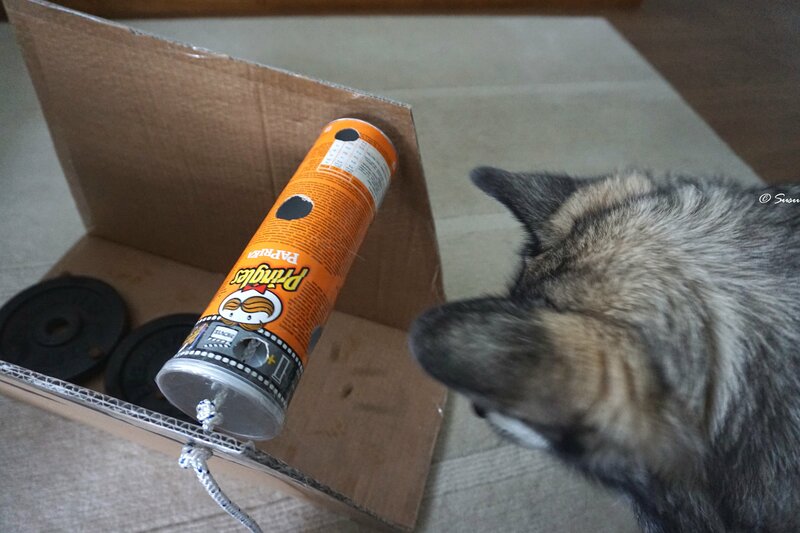 I recommend that you use only dry treats because you can’t open the tube for cleaning if you’ve closed it with tape like I did. 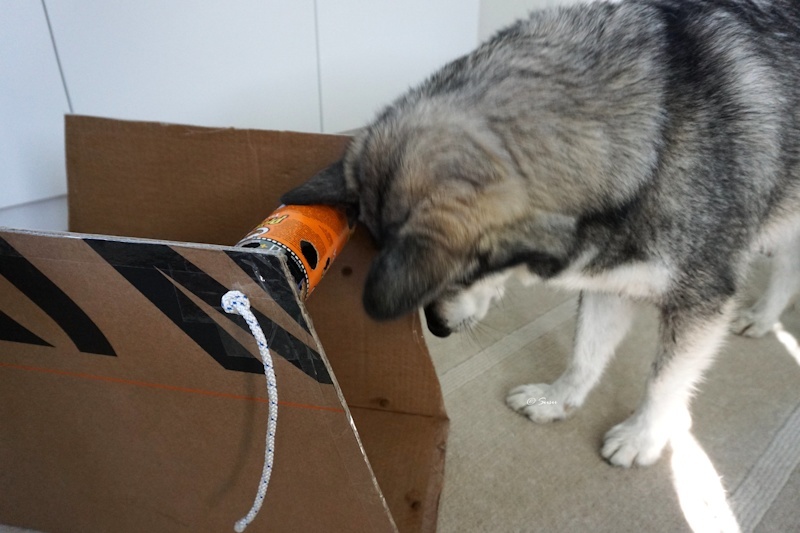 When I introduced the game to Miki I placed a few kibble on the bottom of the holder and on top of the tube. 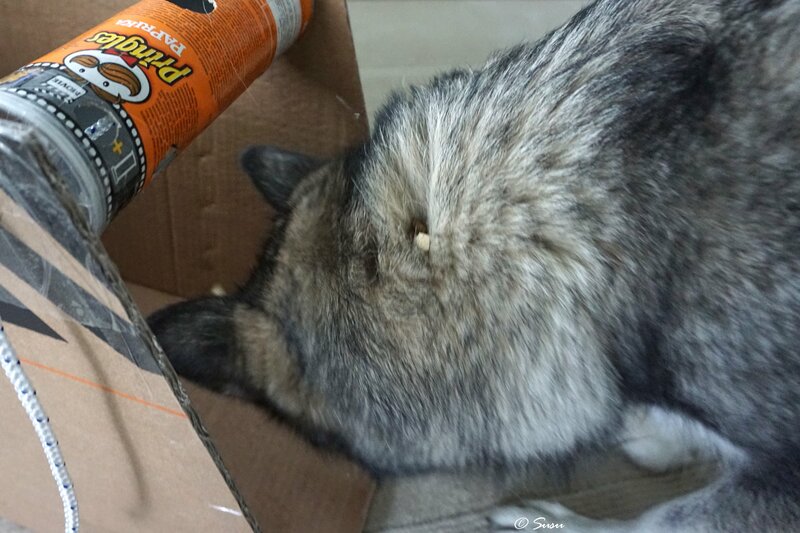 The few kibble fell down with just a slight touch and then Miki got the hang of it and ate the kibble from the bottom. 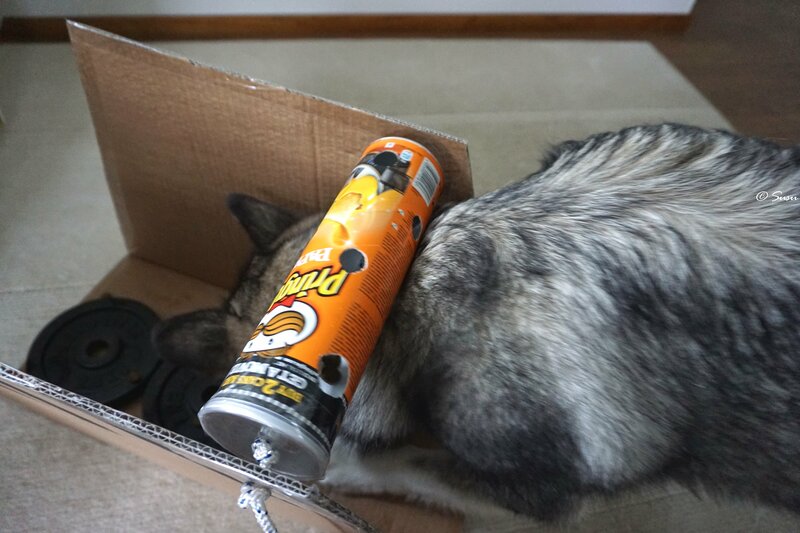 It took Miki about 2-3 minutes to get all the kibble and treats out. 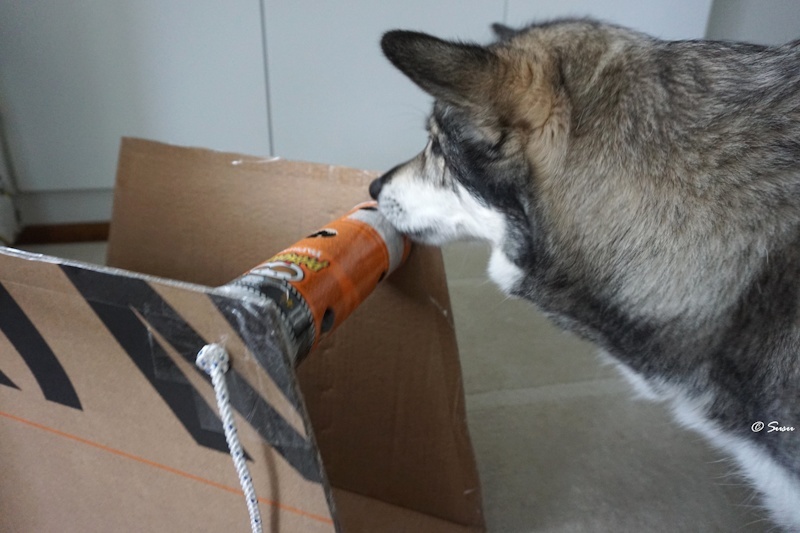 The second time we played this game I covered the largest hole on the tube to make the game just a bit harder. I put a piece of paper on top of the hole and then I secured it with clear tape (mosaic, picture 10). 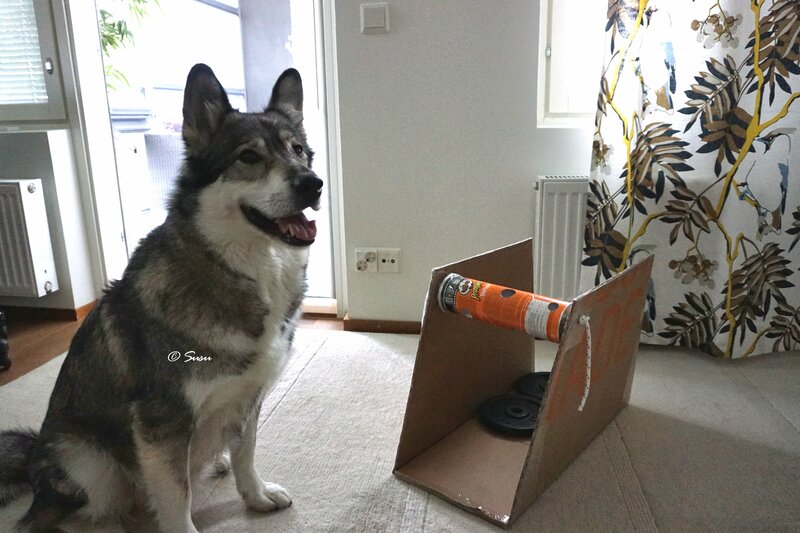 If you cover the holes with just tape the kibble could get stuck to the tapes glue. Later on if you want to make the game harder you can cover up more holes.